Hard water is water that has high mineral content. The name comes from the hard scale that forms when this water is boiled. It is not harmful to human health, but in the industrial setting it causes costly breakdowns in boilers, cooling towers, and other water handling equipment. The divalent cations Mg and Ca are the most frequently found minerals causing hard water. These ions enter water supplies by leaching from minerals in underground aquifers. Cold lime softening is the addition of chemicals to remove the calcium and magnesium ions by precipitation. Cold (ambient temperature) lime softening is used when the mineral content of the source water ranges from 150 ppm – 500 ppm. Treatment consists of five steps: Chemical Pretreatment, Clarification, Recarbonation, Filtration and Sludge Treatment. Sodium hypochlorite (bleach) is added to kill any living organisms that may be in the raw water. Coagulant (usually ferric or aluminum salts) is sometimes added to aid particles to come together. Polymer acts as glue and turns individual particles into larger clusters. The larger particles settle faster and form a more concentrated sludge. Softening is the removal of calcium and magnesium from the water that could leave hard water deposits called “scale.” After the chemical pretreatment, the water flows into the Solids CONTACT CLARIFIER™ softener. The softener provides a reaction zone for the hardness causing ions to precipitate. The lime and (sometimes) soda ash are added in the reaction zone just before the feed enters the clarifier. Lime is added to increase the pH to remove calcium and magnesium hardness. Soda ash may be added to remove calcium hardness if the raw water doesn’t contain sufficient alkalinity for complete removal of hardness. Settled solids react with lime and soda ash to form larger and faster settling particles. The clarified water flows over weirs and the solids (sludge) are scraped to the center for removal and dewatering. The overflow typically has less than 10 mg/L of suspended solids. The amount of hardness remaining will depend on the water chemistry and proper chemical addition. After softening, the pH is lowered to less than 8 to stop the softening reaction. This prevents what is called “post-precipitation” where softening continues in the pipe and eventually the pipe fills with scale. 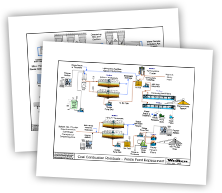 Clarifier overflow may be treated by filtration. As the water flows to the WWETCO FlexFilter™, polymer may be added to improve filtration. Filtered water typically has less than 1mg/L of suspended solids. Intended use directs the stream either to a cooling tower or further filtration. Solids CONTACT CLARIFIER™ underflow is pumped into a thickener. Typically underflow solids are much denser than the clarifier feed with 3-4% solids being typical. Polymer may be added to improve settling and clarity. The thickened underflow is sent to a belt press or other type of vacuum or pressure dewatering filter. The belt press places the solids between two belts and squeezes the water out through a series of rolls. The belt press requires additional polymer to function properly. The resulting cake is then hauled off for disposal. The pressate and cloth wash water are pumped to the wastewater recovery sump along with the ultrafiltration system’s backwash and the R.O reject before recycling into the clarifier. Discharge requirements for industrial wastewater are becoming stricter. 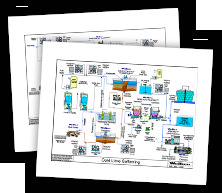 Many companies are moving to zero liquid discharge (ZLD) systems. In this example, water with high total dissolved solids (TDS) is treated before it is sent to a crystallizer. Crystallization is an evaporation process that creates a pure water distillate that can be sent back to the process. The remaining dissolved solids form crystals that can be removed and sent for disposal or used for something like road salt. The pretreatment process protects the crystallizer and the reverse osmosis filtration system by removing material that could harm them. The pretreatment includes three major steps: cold lime softening, filtration, and sludge treatment. Softening is the removal of elements in the water like calcium, magnesium, and silica that could cause fouling or scaling of reverse osmosis or crystallizer equipment. Softening begins with chemical addition. Coagulant and polymer improve the clarification process by encouraging individual particles to form fast settling clusters of particles. The Solids CONTACT CLARIFIERTM Softener provides a reaction zone for the removal of hardness. Lime and soda ash are added in the reaction zone just before the feed water. Three stages of filtration are used; each provides pretreatment to the next. The dual media filters and the AltaFilter™ Ultrafiltration System remove any remaining solid particles. The backwash water is recycled back to the clarifier. Reverse osmosis removes the dissolved solids from the water. The treated water is sent back to the process. The concentrated dissolved solids stream is sent to the crystallizer. The underflow of the Solids CONTACT CLARIFIER™ is pumped into a thickener. Polymer may be added to improve settling and clarity. The thickener increases the concentration of the sludge. The overflow is sent back to the clarifier. The thickened underflow is sent to a filter press or other type of vacuum or pressure dewatering filter.